Anticipation is defined as an emotion involving pleasure and sometimes anxiety in considering some expected or longed-for event. I'm sure that's what all candidates are experiencing today as they anticipate the results of the 2008 election. By the end of the day there will be many who are pleased with the outcome and others who are disappointed. Regardless what emotions we have when all votes are tallied, we should focus on the enormous privilege of living in a democratic society and having the ability to vote. And with that privilege come heavy responsibilities to make wise and informed choices even if we are sometimes disappointed with the final outcome. In some ways,Wednesday morning will be anticlimactic after the increasingly exciting, dramatic, and unusual series of events during this campaign and the ever increasing anticipation and excitement that led up to the election. On the positive side, my mailbox and front porch will no longer be inundated with campaign literature, lawns will be rid of signs, no one will ring my doorbell asking me to vote for their preferred candidate and I can get back to watching my favorite TV programs instead of channel surfing through all the political news and debates. And, most important, I will be able to have normal conversations with family, friends and colleagues and not have to worry about offending someone if I don't share their political views. 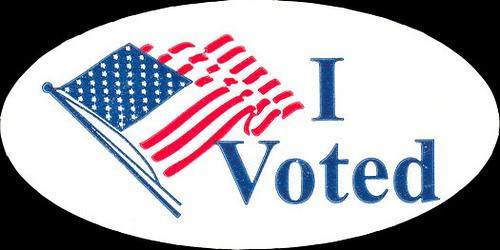 Be sure to exercise the privilege to vote today! Making sound decisions about teaching and learning substantiated by the fact that you use data from assessments is only partially true if you do not also take into account the information you can gather from directly experiencing what your students are experiencing. Do you Twitter? Have you created your avatar in Second Life? Are you a member of an online social network like MySpace or Facebook ? If your answer to these or similar questions is a resounding NO, then you're missing out on an important source of information about 21st century administering, teaching and learning. I have always been of the mind set that if you want to truly relate to kids, understand them and make good decisions about their learning, you have to directly involve yourself in the things that they are doing. To that end, I started out in my earlier administrative years as an avid arcade game player (PacMan) and then moved on to video game playing. For one thing, I wanted to understand the video game language but, more importantly, I wanted to understand the process of video game playing to determine 1) if/how this could be used in the instructional delivery of lessons and 2) what skills were needed to navigate through the video world. More recently, I created an account in Second Life where I created my avatar. Of course, I made myself much younger, thinner, and blond! However, I had a difficult time maneuvering in this huge 3-D virtual world and found it to be overwhelming with the millions of residents moving around. I got very confused by the buy/sell/trade opportunities and just couldn't wrap my mind around the concept of living in a digital continent. On the other hand, there were similarities to video game playing in that the control of actions occurred by manipulating the mouse or hand control. Being married for 43 years, I was very hesitant to join Match.com, the online dating service, so I asked my daughter if I could log in to her account. You can imagine what her answer was to that. The compromise was that she let me view her account while she stood over me watching. In both the Second Life and Match.com networks I learned that one can be anything or anyone they want to be. And in Match.com, my take away was that I am glad I'm not single! I graduated to more sophisticated endeavors when I joined the world of online social networking and created a Facebook account. An estimated 300 sites make up the social network universe according to an article in Knowledge@Wharton. MySpace, with 70 million visitors, has become the digital equivalent of hanging out at the mall for today's teens, who load the site with photos, news about music groups and detailed profiles of their likes and dislikes. Other social network sites include Facebook, geared to college students, LinkedIn, aimed at professionals, and Xanga, a blog-based community site. In all, an estimated 300 sites, including smaller ones such as StudyBreakers for high schoolers and Photobucket, a site for posting images, make up the social network universe. "What we found was that students using social networking sites are actually practicing the kinds of 21st century skills we want them to develop to be successful today," said Christine Greenhow, a learning technologies researcher in the university's College of Education and Human Development and principal investigator of the study. "Students are developing a positive attitude towards using technology systems, editing and customizing content and thinking about online design and layout. They're also sharing creative original work like poetry and film and practicing safe and responsible use of information and technology. The Web sites offer tremendous educational potential." Greenhow said that the study's results, while proving that social networking sites offer more than just social fulfillment or professional networking, also have implications for educators, who now have a vast opportunity to support what students are learning on the Web sites. "Now that we know what skills students are learning and what experiences they're being exposed to, we can help foster and extend those skills," said Greenhow. "As educators, we always want to know where our students are coming from and what they're interested in so we can build on that in our teaching. By understanding how students may be positively using these networking technologies in their daily lives and where the as yet unrecognized educational opportunities are, we can help make schools even more relevant, connected and meaningful to kids." Greenhow suggests that educators can help students realize even more benefits from their social network site use by working to deepen students' still emerging ideas about what it means to be a good digital citizen and leader online. As administrators and teachers, it is important to have a clear understanding of how students are engaged outside of school and in their use of the digital world. The only way to truly understand this is to experience it first hand. Regardless of your age, you're Never2old2learn. In past blogs, I have discussed the Michigan graduation requirements, among which is the inclusion of an online experience for students, making Michigan the first state in the nation to require an online course or online experience for high school graduation. Further, I have shared my belief that if experiencing online learning is good for students, then it only makes sense that it is equally, if not more, important and good for administrators. To that end, as developers of the MI-LIFE (Michigan Leadership Improvement Framework Endorsement) curriculum for school leaders, we included two instructor-led online courses in the MI-LIFE Program. The coursework for the first of these, Aligning Systems, includes assigned reading, developing a visual representation (Gliffy) of the systemic implications of an initiative in an individual's district/school, posting documents to the group online file exchange, interacting in online group discussion boards, and a final project of conducting a comprehensive gap analysis to determine whether the components of the systems within their district/school were in place and that the various domains were aligned so that the system supports continuous school improvement efforts. 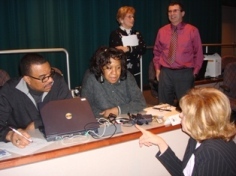 Aligning Systems concluded in July with over two hundred district/school administrators from twelve regions in the state participating in the six-week online course. The majority of the participants had never taken an online course and we were somewhat skeptical as to whether they would fully participate and/or complete the course - especially at a very busy time of year when they were wrapping up the 07-08 school year. The first four columns in the chart below represent data from a survey that was completed by 313 school administrators. The first two columns represent responses to the question, "Have you ever taken an online course?" The second two columns represent responses to the question, "If you answered no, would you be willing to take an online course?" And the final column represents the percentage of administrators in the MI-LIFE program who successfully completed the Aligning Systems online course. "I enjoyed online learning more than I thought. I also believe that the opportunity has helped me to understand what it feels like to be a learner. . .which will help us as we plan for our students." "This was good for me to do. While I have a love for the Internet, message boards, streamed video, etc...I have never had the confidence to learn on-line. Now I do!" This is a huge accomplishment to have so many practicing administrators not only participate in an online course, but successfully complete it and they should be applauded for their commitment. I have been challenged (tagged) by my colleague, Jane Perzyk. This challenge began with Miguel Guhlin suggesting the creation of an online Passion Quilt meme by posting a photo representing what I most passionately want children to learn in school. The photo I selected was taken of me hiking, for the first time in my life, on the trails of the San Jacinto Mountains in Palm Desert, California. 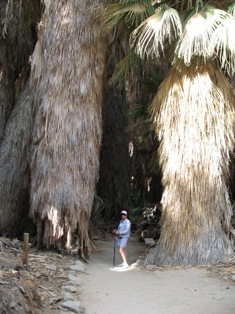 I call your attention to the size of the palm trees (relative to me) that appeared at the start of the trails. My initial thoughts when I saw them were that this was going to be an overwhelming and risky endeavor. On the other hand, there was a sense of excitement mixed in with the fear of the unknown. The anticipation of the positive feeling I would have after accomplishing such a daunting task is what compelled me forward. I'll let the reader draw her/his own conclusions about why I selected this photo to represent what I most passionately want children to learn in school. 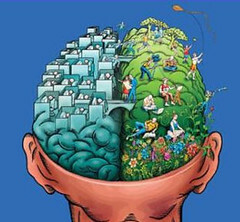 In an article titled Communities of Leaders and Learners published in the Harvard Business Review, Peter Senge wrote: "Poised at the millennium, we confront two critical challenges: how to address deep problems for which hierarchical leadership alone is insufficient and how to harness the intelligence and spirit of people at all levels of an organization to continually build and share knowledge." Over 250 Michigan school leaders from public, non-public and charter schools are confronting these challenges together in the MI-LIFE program that launched this month as they focus on 21st century leadership for 21st century students. At the heart of their learning are activities and knowledge sharing through discussions centered around the research on effective leadership skills that will ultimately improve student achievement. In addition they are learning to collaborate with their peers using wikis and online discussion boards, developing online surveys to assess their leadership skills, and creating graphic organizers to organize their thinking. There is no rationalizing about why things can't change. Instead, their mantra clearly is "how can we"; not "this is why we can't".These leaders are reflective and self-critical. As Jim Collins writes in Good to Great, they are leaders who look in the mirror and not out the window to lay blame when things go wrong. They are seeking solutions to deal with the tough issues of improving student achievement, declining resources, and others with which school leaders are confronted realizing that they must be the first ones to step up to the plate if they want to see substantive change in their schools. By capitalizing on the collective knowledge of the group, these Michigan administrators are building a true community of 21st century learning leaders who have a passion to make things better for all students. I spent an hour this evening from 7 to 8 pm listening to Daniel Pink, the author of A Whole New Mind: Why Right-Brainers Will Rule the Future. But I wasn't sitting on a fold-up chair in a classroom or auditorium. Instead, I heard Pink talk about his book and viewed his presentation on my laptop in the comfort of my own home office via a webinar sponsored by Discovery Educator Network, in the virtual presence of 180 other educators, one of whom lives in Shanghai. R-Directed Thinking is suddenly grabbing the wheel, stepping on the gas, and determining where we’re going and how we’ll get there. L-Directed aptitudes—the sorts of things measured by the SAT and deployed by CPAs—are still necessary. But they’re no longer sufficient. Instead, the R-Directed aptitudes so often disdained and dismissed—artistry, empathy, taking the long view, pursuing the transcendent—will increasing determine who soars and who stumbles. It’s a dizzying—but ultimately inspiring—change. Because I had read the book, I was naturally interested in hearing Pink talk and seeing his slide presentation, but I wasn't prepared for the lively sidebar conversations taking place in the chat window among those "present" as they commented on Pink's remarks. I took a few notes, snagged a couple of his slides, and thought, “That’s that.” But it doesn’t end there. Lo and behold, in comes a Twitter message from one of the note-takers, Vicki Davis, who also probably sat in her house with her laptop, but as it turns out, was part of a cadre of 29 notetakers who, using a collaborative note-taking software, combined their “take” on the presentation into one online document. Within 90 minutes after the presentation, Vicki had posted a link to these notes in her blog and sent out a Twitter message that the notes were now available online. Now, webcasting isn’t a new technology, nor is collaborative writing or blogging, but put them all together, along with the chat notes archived by DEN, market them with Twitter, and you have a powerful way to build and sustain a learning community. There's no two ways about it! MI-LIFE Program about to Launch! MI-LIFE (Michigan Leadership Improvement Framework Endorsement) is a year-long professional learning program for current Michigan educational administrators developed as a result of a grant from the Microsoft Partners in Learning Program to the Michigan Department of Education. Seven courses comprise the curriculum for the program which will begin in January 2008. As the Director of the MI-LIFE Program, I was completely overwhelmed by the response from school leaders to participate in the program. Less than a month ago we announced applications were being taken and within three weeks we had to close the process because we had over 400 applicants for the 200 available spaces in the first cohort! We have since increased that to 250 to accommodate more participants and will start a second cohort in September 2008. My assumption from this kind of response for leadership professional learning is that administrators are eager to become better leaders and are seeking opportunities for this to happen and, more importantly, they are desperate to network in a professional learning community comprised of other school leaders. I need to model for my staff that continual professional development and learning is very important. I must be the instructional leader and keep abreast of the most up-to-date research and educational theory so that I can help my faculty be as effective as possible in the classroom. My application to MI-LIFE is a result of my constant desire to learn more about education, stretch my own beliefs, and become a better leader in my building, district, and profession. I see this learning program as a stimulating forum for me as a professional. I know that personally I need the sharing that comes through working with colleagues. I would like to have a greater impact on student achievement by improving my own leadership skills. As an educator who has had experience at the elementary, secondary and central office levels, I find myself dedicated to continuous improvement in my desire to create systems which will raise student achievement. I am passionate about leadership and feel the curriculum emphasis on leadership will assist me to grow and help my school district to help every student perform to capacity. In addition the skills that I will develop will enable me to work to build the leadership capacity of teachers and principals, particularly in the area of technology, leadership, data and instruction. I want to become an efficient and effective educational leader using data to support improved instructional practice. I would like to use technology information to further evaluate/support both management and instruction for improved student results. I want to develop, communicate, and model shared leadership opportunities with my staff. I would like to become involved in a leading edge professional learning community that will provide me with the knowledge and resources to guide my staff to meet the demands of providing students with a 21st century education. My school is a first ring suburban school that is struggling with AYP, increased diversity, and increased poverty. We have a fairly new staff, and we need to make fundamental changes. Our approach to teaching and learning has not changed in the past 50 years, and we need to modernize our practices. I am trying to spark a change, but I sometimes feel like Sisyphus pushing the rock up the mountain. I know there is a better way and hopefully as part of MI-LIFE I can be part of creating the new American High School. This is a testament to the professionalism of our school leaders. Regardless of the demands from their intense daily work, they are eager to participate in a year-long program, only partially subsidized by the grant, so they can become better instructional leaders and have an impact on improving student achievement. Do you ever say to yourself, "Why didn't I think of this or that- I could be a multimillionaire..?" This past weekend I was kid-sitting my 7 and 9 year old niece and nephew, Alena & Nicholas. Along with all the usual junk they bring when they stay overnight, they brought two cute stuffed animals that they informed me are Webkinz and proceeded to introduce me to the incredible Webkinz online world in which they adopt and name their animal and bring it to life! 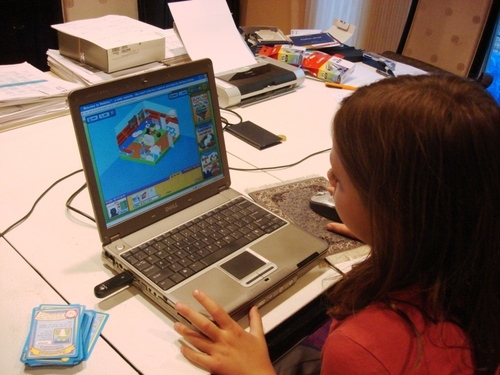 Each Webkinz come with a code that can be used to enter the online world where they can buy food or toys for their pet, take their pet to the vet, decorate their pet’s room, build things, interact with each other, or play educational games to earn Kinzcash to buy more things or save in their virtual bank. 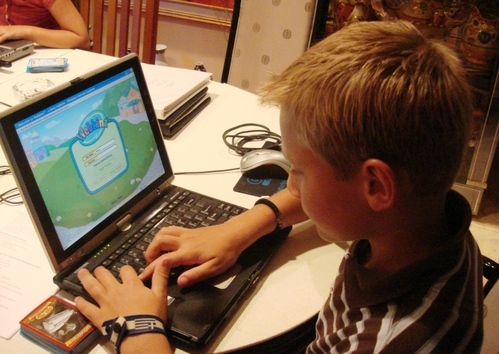 The target group are boys and girls aged 6 to 13, kids who are digital natives; growing up used to computers and the Internet. Monitored by the Canadian parent company, Ganz Inc., the site combines popular online trends such as social networking and instant messaging using preset phrases. However, it is safe for kids, free from advertising and no personal information is required to register with strict limits on how much time kids can spend on any activity. The value of the exact market hasn't yet been tallied, but a report by Packaged Facts counted 29 million U.S. kids ages 8 to 14, with a combined annual purchasing power of $40 billion are interacting in this clever virtual world. Children at 5 and 6 years old are interacting in virtual social networks, learning skills such as money management, responsibility, and appropriate social interactions. They are seamlessly using technology in ways that we never dreamed possible. As administrators, we may never create clever online social networks like Webkinz and become millionaires. But we can impact children in very significant ways by ensuring that our schools are providing an exciting educational environment with technology rich lessons to match what kids are doing at home. We can become knowledgeable enough to provide the leadership in schools and classrooms to educate this generation of Webkidz. If not, we are going to continue to see high drop-out rates and at even younger ages. Story telling never goes out of fashion, and when the stories are humorous and relevant and generate a few brief moments of reflection, they are all the more valuable!
. . . I have learned that if you work with children sometimes you do the teaching, but there are many, many other times, when we actually do the learning. That’s how it works with kids, if you pay attention you do a lot of learning. . . . I have also come to realize that if you keep learning, well then you have a chance to be truly someone special, someone who makes the difference in the lives of children. Do you have a first-day-back story (or maybe one after months in the trenches) that you'd like to share? Just hit the Comments button below and start your tale!